Dr. Meyer provides pulmonary consultations at his Carmichael, California, office that include a complete pulmonary and medical interview, a complete physical examination, chest x-ray, electrocardiogram and pulmonary function tests as complete as those found in most hospitals. He performs diagnostic procedures, such as fiber optic bronchoscopy, at the adjacent Mercy San Juan Medical Center. You may contact his office at 916-488-5864 for an appointment. 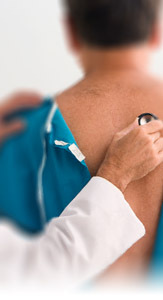 consultations are $200, complete pulmonary function tests $250, chest x-rays $80, electrocardiograms $75. The fee for the total evaluation at one appointment is $500. We will accept and bill some insurance plans through the end of 2002. At that time, we will only accept cash, checks or credit card payment at the time of service. The Harvard Health Study was a large country-wide endeavor to recruit physicians for clinical studies. There were 44,000 doctors that participated in determining if aspirin was useful in preventing heart attacks. Doctor Meyer has been part of the Harvard Health Study since its inception in 1981. He participated in the initial aspirin study for eight years. The code was broken in 1989, and it was found that the 22,000 doctors that took aspirin had far fewer heart attacks than the 22,000 doctors that took the placebo. He continued the clinical study and is currently participating in the continuation of the beta carotene cancer study, now in its 18th year, as well as the antioxidant study, now in its tenth year. In both studies, Dr Meyer does not know if he is taking placebos or the actual drug. He feels that ongoing participation in these research studies is an important contribution to society. Web Medical Consultations are becoming increasingly popular for second opinions. Several of the large clinics have recorded their experiences in the medical literature. These web medical consultations are on a cash basis since they don’t meet the usual insurance or Medicare requirements of a direct patient examination. Web consultations are based on submission of examinations and test results from the patient’s primary and/or consulting physician. You must acquire your own medical records to include a current medical history, physical examination, pulmonary function tests, x-ray reports, electrocardiogram, and any available blood tests. If you do not live near Sacramento and would like a second pulmonary opinion, you may want to consider this twenty-first century approach. Distance is not a factor. Dr Meyer has rendered second opinions to patients from other continents. You will then complete a questionnaire that will be emailed to you, after which a phone interview will be conducted prior to rendering the consultative report. Medicare and Medicaid patients cannot apply. Be sure to include your full name, mailing address, telephone number, email address, and whether you can open attached documents in WP, MSW or both. The fee for reviewing the data, conducting the telephone interview and rendering a consultative report is $400. The consultation fee has to be received before the case will be reviewed and a second opinion rendered. Since we are not your treating physician and a personal physical examination will not be conducted, no prescriptions or treatment will be authorized. You may discuss our recommendations with your personal physician. This is strictly a second opinion that will be rendered in writing based on the information received. For medical/legal and licensing requirements, the opinion is rendered in Sacramento County, California.